It lets you manage all of the files to be compiled into your application; it behaves like Windows Explorer. You have a global view of what will be inside your application. The Folder tree displays the different sub-folders available - as if you were using an FTP program to manage files on a server. To view the contents of a folder, just select it in the Folder tree and its contents will be listed. Note that ExeOutput for PHP can take some seconds for loading the entire file list when you display it for the first time (if your sub-folder contains a large amount of files). The index page is indicated thanks to a small house icon (as you can see on the screenshot). Excluded files are marked with a red cross. If you select the “All Files (real paths)” node in the Folder tree, ExeOutput for PHP will list all files to be compiled with their full path. 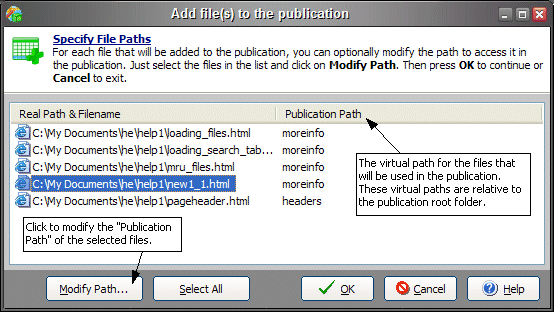 If you select the “All Files (virtual paths)” node in the Folder tree, ExeOutput for PHP will list all files to be compiled with their virtual path (i.e. the path that follows the server or domain name in a URL), see below. ExeOutput for PHP stores file relative paths in projects. Once a project is started, you may move source files to another directory. In some cases, ExeOutput for PHP may prompt you to select the new source folder and the program will try to correct all file path references. It will refuse to compile a project if some files are missing. Virtual paths are paths that follow the server or domain name in a URL; we use virtual paths in applications because they work like servers: to access a compiled file, you need to use its URL. ghe://heserver/ or http://heserver/ are references to the custom internal protocol and namespaces used by ExeOutput for PHP to display files in the custom browser. Note that ExeOutput for PHP automatically manages virtual paths itself (see below); all features related to virtual paths are only designed for advanced users. If you wish to add blank virtual folders to your application, click Add and Add Virtual Folder. You will be prompted to enter its name, and it is then created as a child of the selected folder (if no folder is available or selected, then it is created as a child of the application root). You can then move files to that folder using drag/drop operations. Important: if you do not place any file inside a blank virtual folder, it will be automatically removed next time when your project is loaded. All source files are generally added automatically when ExeOutput for PHP creates your project. But you can at any time add new files, folders or source wildcards to your list manually; or better let ExeOutput for PHP do this task itself thanks to the powerful Source File List Update option. 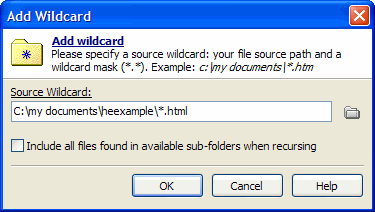 You can enter a path and specify which files should be added using a mask: in the situation shown on the screenshot only .html files from c: my documents heexample will be added. Or you may rather add entire folders (including their sub-folders or not) using the “Add Folder” command. The real paths appear on the left; on the right you can determine the related virtual path (a.k.a application path). By default, ExeOutput for PHP automatically tries to find the best virtual paths. But you can change this yourself: just select one or more files, then click “Modify Path”. You will be prompted to enter the new virtual path and confirm your changes. You can see that the virtual paths “moreinfo” and “headers” appear as children of the application Root, although the files that were added do not belong to the source folder. This option is powerful because you can actually add files from any folder and determine virtual paths yourself. The main advantage is that you do not need to copy the different source files to the source folder first in order to have them be compiled. from Windows Explorer and other shell windows. Select all the files in the explorer, drag them onto the manager’s file list and they are automatically added to the list. You can launch Windows Explorer by clicking the Explorer button. You can be prompted to enter the virtual path for the dropped files as explained above. in the File Manager itself: you can move files from a virtual folder to another (thus their virtual paths can be changed the way you want). Highlight the file(s) you want to move in the list, then drag and drop them onto the destination folder in the Folder Tree. Note that real paths are not modified (source files are not physically moved). To remove one or more files from the list, select it/them and press the Remove button. You can select multiple files by pressing Ctrl+Click or Shift+Click. You may also use the Select All menu command from the context menu. Finally, the Clear button lets you remove the entire folder currently selected in the Folder Tree. This includes all files and subfolders which are children of that selected folder. This operation cannot be undone, so be careful! It is also useful to remove empty folders. you cannot remove the index page from the application. you cannot clear the application root: use the Remove operation instead. removing files does not delete files from your hard disk. This only “removes” files from the application. ExeOutput for PHP displays information about each file: filename (or file path/virtual path), file type, size… If you need to sort your files according to a specific data (for example, file types), just click the associated column. You may also resize the different columns. Generally source files need to be updated: you can add new files to the source folder, update existing ones or even remove non-used ones. In other words, the contents of the source folder may vary and consequently the file list kept by ExeOutput for PHP may be outdated. if new files are found (not in the file lists), they are added. You can optionally be prompted to specify the new virtual paths (see the Environment Options). if some source files are newer, ExeOutput for PHP updates its file lists. if some source files are not found (you could have deleted them), they are removed from the file lists. You can also be prompted to confirm the operation (see the Environment Options). You consequently do not need to manage the file lists yourself manually. click the Update button in the File Manager. configure automatic File List updates using the Environment Options (when a project is loaded, compiled; or enable source folder monitoring…). You can manually indicate which subfolders should be excluded from the File List update by clicking “Exclude Folders” and adding full paths to the folders you want to exclude to the dedicated list. You can also exclude some files from being added to the file list based on their extension: go to the Environment Options. Note: File List Update only takes account of files in the source folder (or subfolders)! If you have files from other folders, the operation will ignore them. Select a file in the list and click the Edit button. If the selected file is a PHP or HTML compatible page, then the internal PHP/HTML editor will be displayed. Otherwise the program registered with the file will be opened to edit it (this is exactly as if you were double-clicking the file in Windows Explorer). You can configure some options regarding compression, security for the source files. Select a file in the list and click the Properties button (or double-click it). The file properties editor will then be displayed. 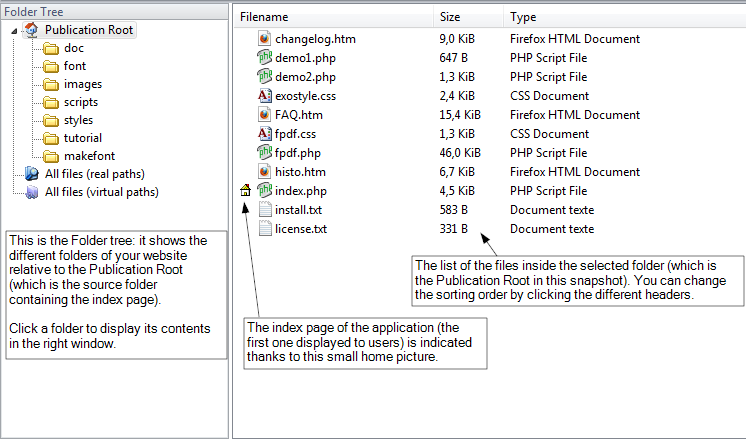 More information about the file properties. All of the previous commands are also available from the context menu: click the list with the mouse’s right button to display it. It contains additional commands not directly available such as “Select All” or “File Information”. The last command gives you global information about the application files of the selected folder (total size, number of files…). Finally the “Shell Properties” command will display the “Properties” dialog available in Windows Explorer (lets you access to the properties of the selected file). Copyright G.D.G. Software 2019. All Rights Reserved.